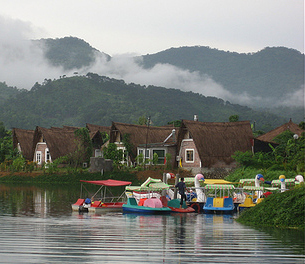 How Hanoi than an hour of car, can be found between populations of the tourist area of Ba Vi - Ha Tay, Tan Da Spa Resort is designed as an open and peaceful modernization, a new image for the interfering between nature and man. With the aim of serving the needs rest nursing, to Tan Da Spa Resort as you step into a new space in a quiet, clear sign. Feel deeply impressed by a regional non tr?i cloud of land T?n mountain living has to legend Son Tinh, Thuy Tinh visitors will have freedom from turbulence, chat ch?n by market players and socialize with their with nature. System with 50 rooms and designed the architecture of specific regions of the Northern village (the Vietnamese Co) and cells of the upland ethnic groups (the Lac Viet), visitors will experience life and get a foot in most every culture's definition ng?i Vietnamese. Space outside the green cool, comfortable with bamboo shade structure, water wells giàn elected; interior decoration is simple but modern with a combination of bamboo, of wood, ... tourists has escaped from the pressures of the day for the moments of life in peace time. Besides the normal facilities such as cable television, refrigerator, air conditioner, especially mineral water system hot - cold room ... will help visitors have moments of rest the most excellent. Hotel rates per night are inclusive American breakfast. Single room = One person, Twin room = Two persons, Triple room = Three persons, including extra bed.